An affordable, Swiss-made chronograph, the Tissot V8 Quartz Chronograph T106.417.16.032.00 Men’s Watch is a feasible alternative for the mechanical options that are costing a bomb! Tissot’s access to a broad spectrum of manufacturing resources helped them to lower the price barrier and created a piece that’s more of a hit than miss. Tissot’s reputation as a racing brand continues but without shedding its traditional looks. The deep set dial steals the show. It is somewhere between white and a pale, cream shade, offering a subtle contrast to the grey hands. The outcome is a kind of clarity that makes reading time easy but doesn’t hurt the eyes. The dark green bezel with a tachymeter scale measuring speed up to 400 kilometers/miles per hour surrounding the dial and holding the sapphire crystal is another soothing addition to the whole ensemble. The dial layout of the Tissot V8 Quartz Chronograph T106.417.16.032.00 Men’s Watch is completely dashboard-inspired. The counters and the tachymeter bezel reminds of the motorsports in the mid 1900-s and brings more than a fair amount of adrenalin rush, which is essential for living off the edge with a zero tolerance for missing out on actions! The counters represent 30 chronograph minutes in increments of 1/10th of a second, while the central 60-seconds chronograph hand supports ADD and SPLIT functions. That’s all you need for speed sports. The perforated leather strap makes the Tissot V8 Quartz Chronograph T106.417.16.032.00 Men’s Watch wearable for without any break. The buckle is neatly rounded off along its edges and brought to an ultra-smooth, mirror polish that spreads the reflected light, thus avoiding the tinny shine even many a high-end watches fail to escape. It’s rich leather, hence parity is maintained. It needs a little breaking in; however, it’s supple enough not to cause any trouble with first time use and tough enough not to cause either with prolonged usage. This perforated strap is not exactly dressy unless cargos, cabin boots and bright, colorful shirts are what you consider to be dressy. 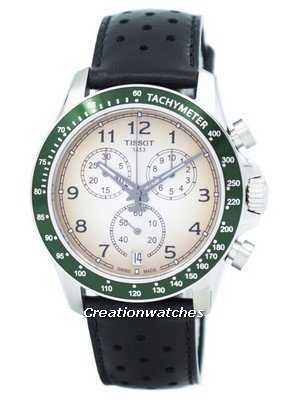 Inside the case is an ETA G10.212 – A workhorse Swiss quartz movement with chronograph functions. It’s very accurate, robust and comparatively cheaper than many of its peers. It consumes less battery; expect a three-year gap between battery changes provided you use the chronograph moderately, about three times every two days. The scratch resistant Sapphire crystal is absolutely invisible from certain angles and allows a view of the beige/silver dial as it is. Even for the luminous hands and markers. Bottom line: The Tissot V8 Quartz Chronograph T106.417.16.032.00 Men’s Watch is a decent-looking, everyday chronograph watch that doesn’t stare at you or at an onlooker, making it a safe choice to be worn either at work or at the club. This entry was posted in Tissot Watches and tagged Tissot V8 Quartz Chronograph, Tissot Watches on November 2, 2018 by citizenwatches. An all-timer watch that gives you the complete freedom to wear! It suits any place, any time – no dress too casual or too formal to make you miss wearing it even for a day! On one hand, it exhibits some of the most prized classic style elements that keep it above the wave of fleeting trends through virtue of its sumptuous look. Its highlight is a graceful dial, designed with elongated fine hands in mind. The Tissot T-Classic Carson Quartz T085.410.22.013.00 Men’s Watch is a classic beauty, the kind that adorns the archaic traditional watches. A traditional style recreated with Swiss engineering excellence, it is sophisticated and stylish and underlines the core values of precision timekeeping amidst multiple settings. Tissot gives out their classical side a bit and brought about this refreshing piece of advanced technology committed to excellence. With a look that takes you close to die for, it is an excellent example of fine craftsmanship put into a much-appreciated form. An abiding style is what you’ll extensively notice in the Tissot T-Classic Carson Quartz T085.410.22.013.00 Men’s Watch is its veracity toward attaining a preeminent character. The Tissot T-Classic Carson Quartz T085.410.22.013.00 Men’s Watch combines classic styles and mellows them with a contemporary edge. It is sophisticated, stylish, simple, real and perhaps the best in its own category. Putting into use its pioneering craftsmanship since its foundation in 1856, the Tissot T-Classic Carson Quartz T085.410.22.013.00 Men’s Watch is one of the best examples of the brand’s innovative prowess. This masterpiece creates an aura weaved with masterful engineering and beautiful designs. It’s a push for the affordable luxury segment to extend bit further. The identity of the Carson range shines bright through the Tissot T-Classic Carson Quartz T085.410.22.013.00 Men’s Watch. It has a fine, timeless detailing that speaks for it. Undoubtedly a good choice while searching for that perfect accompaniment to wear in any occasion! 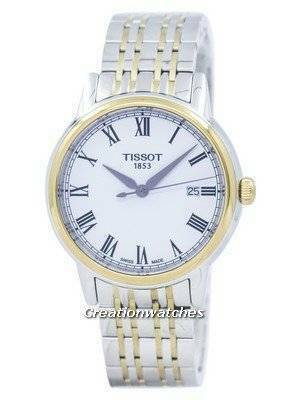 The classic features of the Tissot Watches For Men are Tissot’s homage to the Swiss watch-making heritage. Consistent in its accuracy, the Tissot T-Classic Carson Quartz T085.410.22.013.00 Men’s Watch illustrates technological artistry hidden in fine craftsmanship making for a classic watch. Believing strongly in enjoying every instant of living is what turns you toward the Tissot T-Classic T-One Automatic Men’s Watch. It makes the most of every second and a perfect tool that reminds you of pleasant things with its simplicity. An everlasting, elegant style that tends from pure to more-sophisticated, bringing a vintage feel built with state of the art, contemporary technology. This entry was posted in Tissot Watches and tagged Tissot T-Classic, Tissot Watches on March 30, 2018 by citizenwatches.